The first I have read by Jill Mansell,this a re-release of a book initially published in 2006. I’ve heard wonderful things about this UK author’s writing, so I couldn’t wait to dive in. Lottie is a single/divorced mother of two, living in one of the more picturesque areas of England, the Cotswolds. Mansell uses that sense of place and the uniqueness of life to ground the story in a way that is both familiar and different. With Lottie’s job comes a new opportunity in the form of her boss, Tyler. He’s a wonderfully well-developed character and the potential for an epic love story is established. But then, Lottie did what so many people do: she allowed her children (who aren’t particularly attractive in behavior or approach) to dictate her life, far above and beyond their purview. They HATE Tyler, with few good reasons, and their constant sniping, sass and whinging have her capitulating to their desires in lieu of her own happiness. I was so frustrated with her behavior, the bad example set for the kids by not requiring their atitudes adjust and they behave with proper manners, no matter their thoughts, that I was ready to strangle her. And OH – I’ve been there – as a single mother you have to make relationship choices for you, while the kids are considered, it wasn’t as if Lottie was bringing in a string of men. Then, not surprisingly, along comes another option in the form of Sebastian, and everything is wonderful and glorious. The kids love him and would sing songs and dedicate days in his honor if they could. But things aren’t quite right – in fact I found him a little “too” perfect, and that tiny voice deep down in Lottie’s head thinks it too. She still pines for Tyler and the fit that was their relationship, but doesn’t see a way to make it work. Starting out with a bang, the story built a wonderful premise with characters that were complete and complex with faults and fears mixed in with their good qualities. But somewhere in the late mid-point of the story, the characters started to behave in ways that were more exaggerated and caricature, less grounded in reality than I would have hoped for. The funny thing is, that people DO often exaggerate qualities, or behave ridiculously, and there was a tenuous tether that kept me in the story as I needed to know just what Sebastian’s major malfunction was. With the addition of children, a series of mix-ups and a love that is not to be denied, this was an interesting introduction to this author’s work and will have me adding more of her titles to my ever-growing TBR pile. 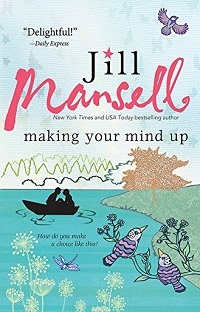 With over 10 million copies sold, New York Times and USA Today bestselling author Jill Mansell writes irresistible and funny, poignant and romantic tales for women in the tradition of Marian Keyes, Sophie Kinsella and Jojo Moyes. She lives with her partner and their children in Bristol, England.